Pull out your napkins and put on your bibs…things are about to get messy! Please tell me that you are not one of those people that eats your barbecue ribs with a fork! 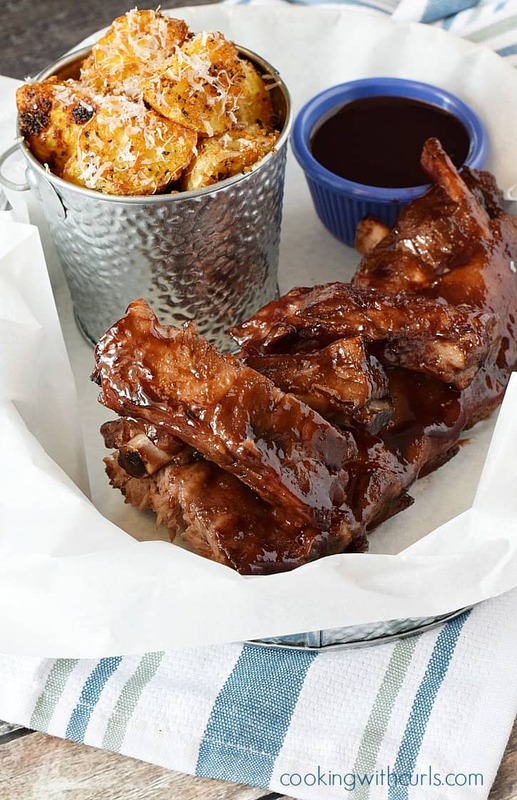 These Cabernet Barbecue Ribs sound sophisticated, but they are still good ‘ol, gettin’ messy finger finger food. We don’t do pretentious around here….. I have loved barbecue ribs for as long as I can remember. Ribs were always my birthday dinner choice as a kid, and I had to try out every new barbecue place that opened up in town. Now, I just stay home and create my own flavors, like Guinness Barbecue Ribs and Bourbon and Brown Sugar Barbecue Ribs. Preheat oven to 300 degrees. Line a baking sheet with heavy duty foil. Spread onion rings out on the baking sheet. 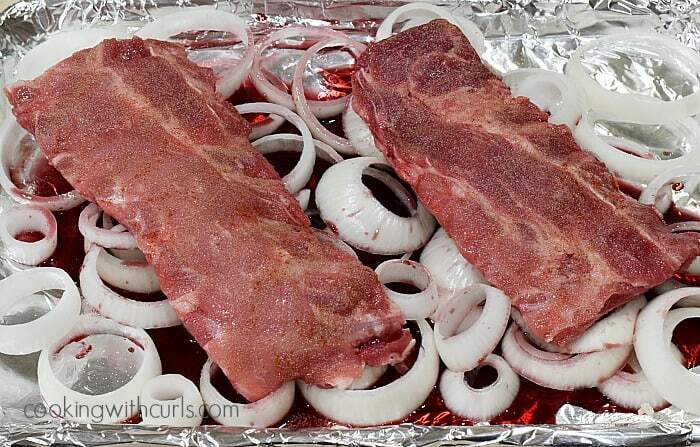 Place ribs on the bed of onions. If the rack is too long, cut in half. 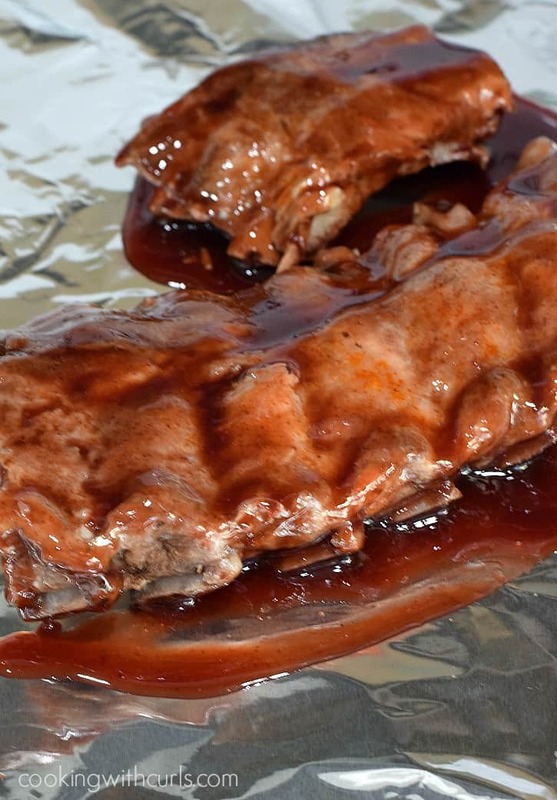 Sprinkle ribs with garlic powder, onion powder, and black pepper…..
Pour wine over the ribs, cover with foil, and bake in the oven for 2 hours, or until meat pulls away from the bone. Thicker ribs will take more time, at least an additional 30 minutes. Remove from oven. 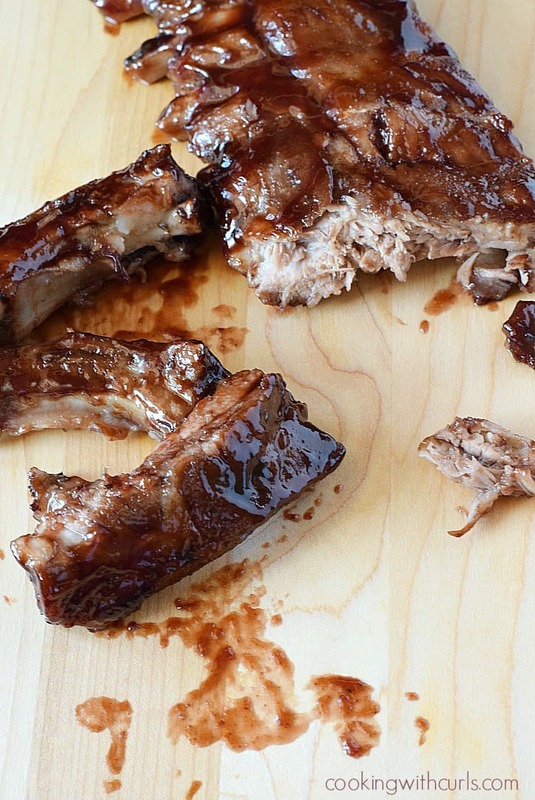 Place ribs on a plate / platter and clean off the baking sheet. (Yes, you could just use a clean one if you wish). Set oven temperature to BROIL. Cover both sides of the ribs with barbecue sauce…..
Place about 6″ under the broiler, and allow sauce to bubble and caramelize. Flip over and do the same on the other side. 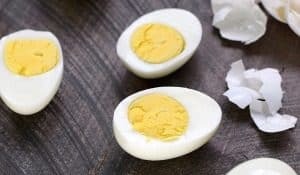 Serve with additional barbecue sauce…..
and some type of potatoes like Crispy Herb Roasted Potatoes, Crispy Italian Roasted Potatoes, or some Baked Potato Wedges. Oven baked Cabernet Barbecue Ribs make a summer time favorite easy to enjoy any time of the year! Sprinkle ribs with garlic powder, onion powder, and black pepper. 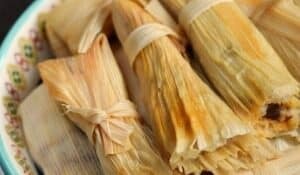 Cover with foil, and bake in the oven for 2 hours, or until meat pulls away from the bone. Set oven temperature to BROIL. 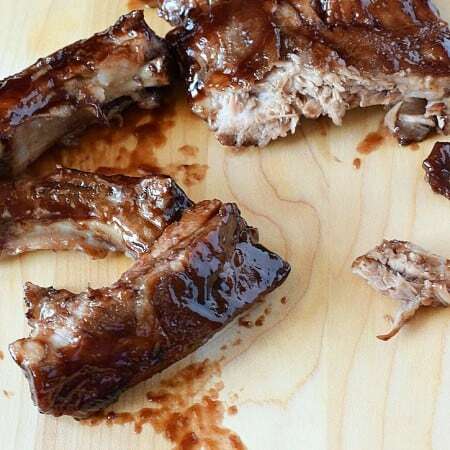 Cover both sides of the ribs with barbecue sauce. Place about 6" under the broiler, and allow sauce to bubble and caramelize. Flip over and do the same on the other side. 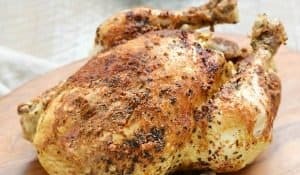 You will have Cabernet Barbecue Sauce left over to use with another recipe. The nutrition facts include the entire barbecue sauce recipe.